The decision reported by Reuters and AP, citing anonymous U.S. officials, would send a signal that the United States is serious about engaging the Taliban and making progress in peace talks to end the longest U.S. war, media said. U.S. military commanders recently have acknowledged little progress is being made on the battlefield or at the peace table despite a reported meeting last month between a U.S. diplomat and Taliban leaders to explore possible negotiations. The outgoing U.S. commander in Afghanistan insisted on August 22 that despite a recent wave of violence, Trump’s strategy of an open-ended deployment of U.S special operations forces and increased air support for Afghan forces is succeeding. “I believe the strategy is working… The reconciliation progress is significant and ultimately wars end with a political settlement,” said U.S. Army General John Nicholson, commander of the NATO-led Resolute Support mission. Trump, however, has expressed frustration that U.S. forces still seem so far from withdrawal after 17 years of war. In a policy shift during a June cease-fire, Washington said it would “support, facilitate, and participate” in any Kabul government-led peace talks with the Taliban. Washington and Kabul both on August 22 said they would not join peace talks that Russia is hosting in Moscow on September 4, saying such talks were unlikely to yield progress. Russia claims that the Taliban will be joining the talks. The Taliban has spurned repeated offers for peace talks by the Kabul government this year, insisting that it will only negotiate directly with the United States — something Washington refuses to do. Meanwhile, the Taliban has staged a surge in attacks this summer, including an assault last week on the provincial capital of Ghazni that took U.S.-backed Afghan forces four days to put down. While the Taliban observed a government cease-fire over the three-day Eid al-Fitr festival in June, raising hopes for peace talks, it has so far ignored an offer by Afghan President Ashraf Ghani this week for another cease-fire. In addition to his experience advising or working for four U.S. administrations and his knowledge of Afghanistan’s main languages, culture, and politics, he is from the ethnic Pashtun majority and is close to Ghani, the former official said. Pompeo’s decision to tap Khalilzad shows the administration is “serious about getting a peace process going,” the official told Reuters. 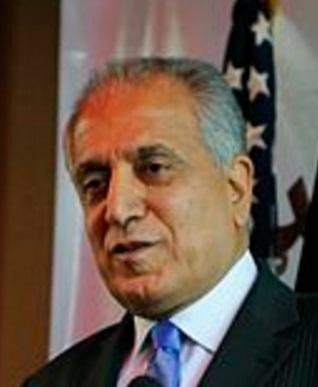 Khalilzad was born in the northern Afghan city of Mazar-i-Sharif and has served in a variety of U.S. government posts. As an aide to President George W. Bush, he helped plan the U.S. invasion of Afghanistan that followed the September 11, 2001, attacks. That invasion was largely successful at ousting the Al-Qaeda militant group from Afghanistan while deposing their hosts, the Taliban, which ruled the country at the time. Khalilzad served as U.S. ambassador to Afghanistan from 2003 to 2005, and he helped draft the country’s constitution. Why do Americans keep sending this idiot to Afghanistan? He is one of the biggest dummies in govt.